1 Publications by "A. Chowdhury"
Muscle satellite cells, also known as myogenic precursor cells, are the dedicated stem cells responsible for postnatal skeletal muscle growth, repair, and hypertrophy. Biological studies aimed at describing satellite cell activity on their host myofiber using timelapse light microscopy enable qualita- tive study, but high-throughput automatic tracking of satellite cells translocating on myofibers is very difficult due to their complex motion across the three-dimensional surface of my- ofibers and the lack of discriminating cell features. Other complicating factors include inhomogeneous illumination, fixed focal plane, low contrast, and stage motion. 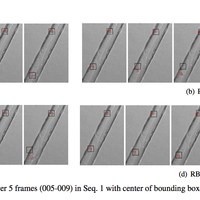 We pro- pose a semi-automated approach for satellite cell tracking on myofibers consisting of registration with illumination cor- rection, background subtraction and particle filtering. Initial experimental results show the effectiveness of the approach. A. Chowdhury, A. Paul, F. Bunyak, D. Cornelison, and K. Palaniappan. Semi-automated tracking of muscle satellite cells in brightfield microscopy video. IEEE Int. Conf. Image Processing, 2012.